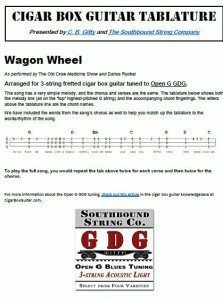 Cigar Box Guitar Tablature Library added | The How-To Repository for the Cigar Box Guitar Movement! We have just created a new section of the knowledgebase here on CigarBoxGuitar.com which will host a growing library of tablature for cigar box guitars, with a focus on the popular Open G “GDG” tuning style. We have added a few initial pieces of tablature and more will be coming soon. Click the image below to check out what has been added so far! I am new to all this, but have built a diddleybow, two slide three strings and two fretted three strings. Now I am trying to learn how to play them! Does anyone have a tab for Rocky Top? It is football season and a fun song to play.